At 11.04am, a report came into the Chain Home radar station at Dover. Within ten minutes others had followed, bringing news of around 120 incoming Luftwaffe aircraft. Consistent with the rest of the Battle of Britain, 11 Group bore the brunt of the attack. Their strategy was to force the Messerschmitt fighter planes into conflict to starve them of fuel and force a return to France, and it proved a success. After two waves of attack the Dornier bombers were left unguarded as the Me 109s headed home. 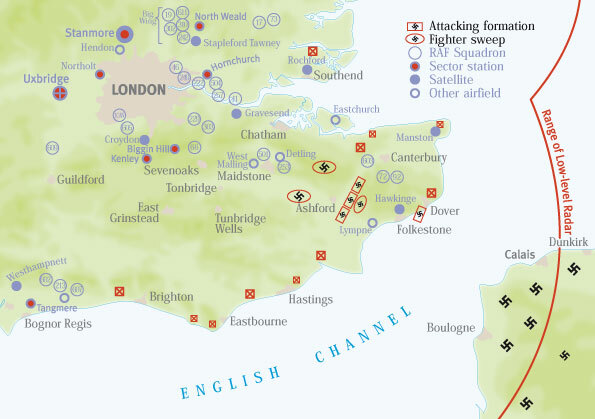 12 squadrons entered into battle with the bombers – 127 British fighters against 25 German bombers. A force that was supposed to be on the verge of collapse filled the sky; the British pilots’ furious attacks further eroded German confidence. At 12.45pm, the all-clear sounded. Just nine bombers had made it back to France.